You ask: Is "red" Food bad? We answer: No way! You ask: Can a harsh Viking make do with no Food at all? We answer: Easily! Leave your troops hungry, and nothing will happen to them. Same for your Town – zilch. Of course, there are some disadvantages. Let's consider the theory. The Farm resource building is responsible for Food production and the maximum amount of Food storage in the Town. If the amount of produced resource exceeds the Farm's capacity, then Food production stops. Example 1. The Food production speed is 100 units per hour, and the Farm capacity is 1,000. The resource will stop being produced when the maximum capacity is reached. Example 2. The Farm has produced 500 units in an hour (with the same capacity as in the first example), while your troops are carrying 600 units of Food from a resource location. As soon as they return to the Town, Food production will stop. You can find the information about buildings' capacity in the Palace statistics (in the Economic section of the Resources tab). Example 1. There are 90 T1 units in the Town. Food production is 100 units per hour, the Farm capacity is 1,000. The maximum Farm capacity will be reached not in 10 hours, but in 100 hours since 90 units are consuming the Food. If there are 101 units in the Town, Food production will stop, and Food will be highlighted in red on the resources panel. The Farm actually will continue producing the resource, but the produced Food will be consumed by the army. Also, all Food that is brought to the Town (e.g. by convoys) will be primarily used for warriors. Please note: sooner or later, the Food amount that is highlighted in red may go to zero (but not go into minus). Of course, your army will go hungry, but it won't affect its military stats. Example 2. Your warriors have gone hungry for 2 hours. You bring them 200 units of Food – the amount of the resource will slowly start decreasing – the warriors have a moderate appetite that won't increase even after long starvation. So lack of Food has no ill effects? Yes, the military stats of your warriors don't decrease, your army doesn't break up, units don't die or go to the Infirmary, and even the Farm doesn't burn down. Everything stays the same. But the fact that the Food required for Town development is being eaten by your warriors will prevent you from constructing and upgrading buildings, learning Knowledge, summoning Aesir, etc. In this situation, before asking for Food from your clansman or buying it for Gold, consider beforehand how much resource you need for starting a particular process. And don't forget to add some millet for you warriors to that amount! If you can't stand your Food being in the red, do something about it. You need to increase Food production or reduce Food consumption. Or do both. Just imagine: level 30 VIP status reduces Food consumption by 50%, and the Great Economy boost reduces it by 75%! You can also choose to not reduce consumption, but instead reduce the number of surplus warriors. Enter the Palace statistics, the Economic section, check your Food consumption and production. Then proceed to the Military section of the Troops tab. Note how much Food is consumed by every type and tier, then dismiss the warriors you don't want to feed. Temporary measures when the Food production has stopped: send the Food you gathered to the bank – an ally who stores the resources of the whole Clan in their Town – and Food production will start up again. You've already understood that lack of Food is not fatal for a Viking. But you're not only a warrior, you're also a strategist who needs to develop and grow. Read on to find out where and how you can get Food. - Capture resource locations. 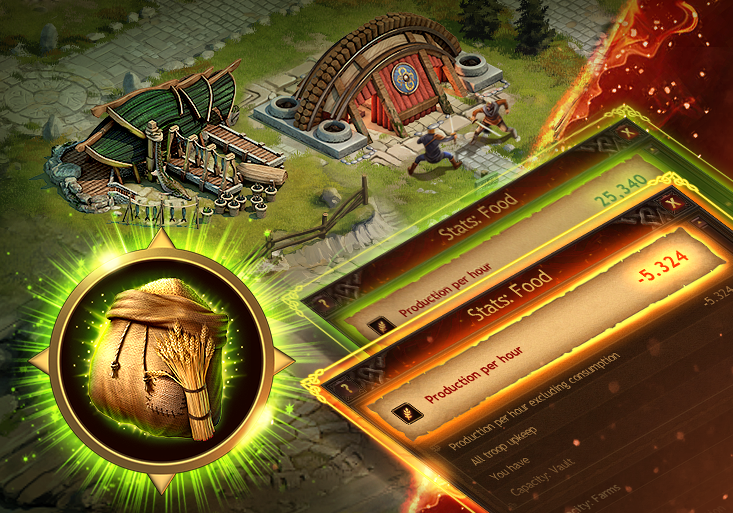 By yielding a higher amount of resources or totally devastating the location, your troops can bring an item containing resources to your Town. You can also receive Food by completing various game actions (Quests, Tasks, upgrading the Palace, etc.). • Troops consume their Town's Food. This happens regardless of their location – in reinforcements in a clansman's Town, in the Town of an Onslaught initiator, or in a resource location. • In the Infirmary, warriors are healed, not fed. Warriors that are being healed or resurrected don't consume Food. You decide if you need to deal with a "red" Food value or not. But remember: you can live without Food.